Signing-up to a pension scheme is just the beginning of AE compliance. There are many ongoing responsibilities that carry heavy penalties for non-compliance. Each time you process payroll, you must assess the workforce, auto-enroll, communicate, process opt-in and opt-out requests and so on. And in order to do these, you must transfer the data back and forth between your payroll and pension systems – every single week or month. This is an admin nightmare that can cost your business time and money as well as expose your employers to compliance risks. With our unique approach to creating solutions for Bureau companies, we don’t settle for anything less than an automated solution. Exporting to CSV from one system and importing in to another system in every pay period is simply not an adequate solution for Payroll Bureaus! And thanks to the combined expertise of the Accentra, Smart Pension and PensionSync teams, we have produced the most elegant solution in the industry. 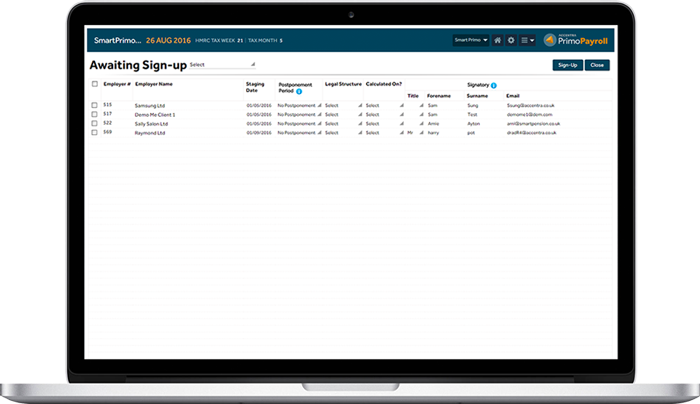 A truly unique auto-enrolment solution that virtually takes away all the burdens of AE compliance obligations from bureaus and employers alike. It’s so simple and powerful, it’s an absolute game-changer. Migrating from another Payroll and/or Pension Provider? Whether you wish to migrate to from another Payroll software or a Pension Provider or both, our dedicated migration team will be on standby to make sure your precious data and settings are migrated smoothly and verified correctly. Regardless of the current status of your auto enrolment compliance, we can help you migrate. Primo Payroll offers a payroll migration service helping you to move from your existing payroll software to Primo Payroll. Even if you are part way through your tax year, Primo Payroll can help you move across easily so you can benefit from its low-cost fully automated AE solutions in time for your next pay run. No problem, we can help you to move to one of the pension providers that supports API automation integration. Acting now will save you time, money and more importantly the risks of non-compliance. Smart Pension’s state of the art platform allows migrating from other pension providers with ease. Primo Payroll supports such migrations gracefully allowing you to save time, money and avoid compliance risks. 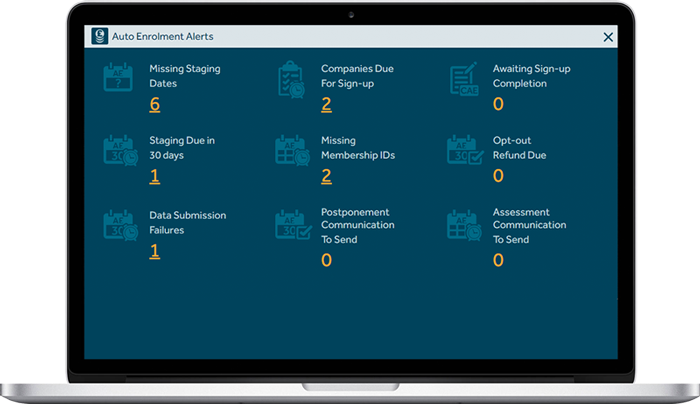 The AE notification panel alerts you to clients that have no staging date set up yet. 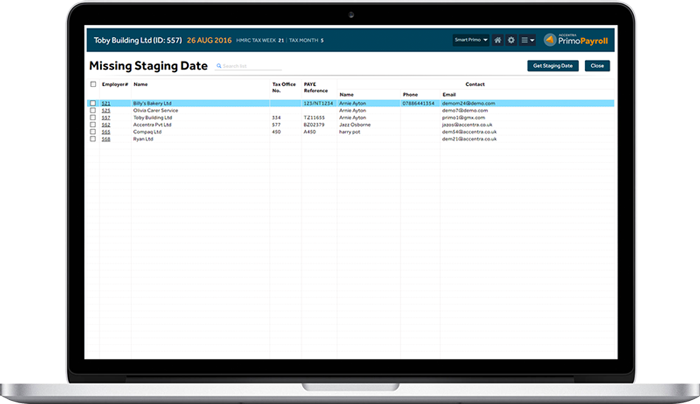 A single click will retrieve the staging dates for all of them at once, without having to leave Primo Payroll. Get notified instantly of the clients that are due to sign up for the pension scheme. Then simply click the notification icon to view the list of clients and, with another click, complete the sign-up process for all clients. All clients get signed-up automatically with Smart Pension and their employees get registered on Smart Pension’s platform. New starters after the signup get registered with Smart Pension automatically too. Its just one system and one screen that does the job for a multitude of clients – as opposed to dealing with two systems for each client separately! As you know, signing up to a pension scheme is just the beginning of AE compliance. There are ongoing responsibilities that you must remember to complete for each client such as assessment, enrolment, communication and so on, and then you must transfer this data back-and-forth between your clients’ payroll and the pension system – every week/month! An expensive and risky proposition when you have to deal with several clients. With Primo Payroll, as you go about completing tasks such as running the payroll and closing the period, all tasks get completed and the data transferred is between Primo Payroll and Smart Pension, all automatically. There’s nothing to remember – it just works.